(Newser) – US leaders are hitting out at Vladimir Putin after statements he made appeared to some to be anti-Semitic. 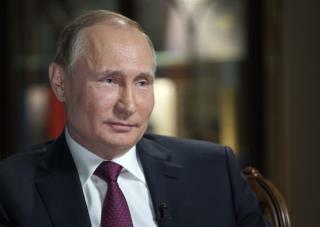 The Russian president was defending his government in an interview with NBC News' Megyn Kelly Saturday when he said Jews may have been behind 2016 election meddling. "Repulsive Putin remark deserves to be denounced, soundly and promptly, by world leaders," Sen. Richard Blumenthal from Connecticut wrote on Twitter following the interview, per the Washington Post. Blumenthal's sentiment was echoed widely by fellow Democrats in Congress, the Anti-Defamation League, the American Jewish Committee, and others. When Putin talks about the "Jews", he's talking about Netanyahu and Israel who were very anti-Clinton. It's neither a dumb remark nor antiSemitic. Unfortunately, all of our "minority victims" react like Pavlov's dogs when they can interpret something as anti themselves. Despite all of the losers' theories, no one, yet knows who, if anyone, really tried but failed to affect the elections. Putin knows the Jews, the Rothschild's are the ones who create all the chaos around the planet. They are the owners of all the banks and us. The countries whos banks are left to control are N Korea, Cuba and Iran and once they are controlled they will usher in the New World Order, the Rothschild's, Illuminati, Lucifer all the same.